An outer space mission in the quest to unlocked the mystery of human genetic codes had yield undesirable results to the DNA of its astronauts: The leader, Dr. Reed Richards (Ioan Gruffudd) now able to stretch and contort his body into any shape one could ever imagine; Sue Storm (Jessica Alba), also Reed’s ex-girlfriend, is able to render herself and the surrounding objects invisible with a powerful force field; pilot Johnny Storm (Chris Evans) could now engulf his body in flames and take flight at will; and astronaut Ben Grimm (Michael Chiklis), also Reed’s close pal, becomes an orange-colored, rock-like, “Thing”, with Superhuman strength and is practically indestructible! Though they were now misfits in the society, they soon put their nature-gifts into good use against the steely-eyed, iron-fisted nemesis Dr. Victor Von Doom (Julian McMahon), protecting the citizens of New York City against any of his vicious plans. The well-loved Stan Lee and Jake Kirby's "Fantastic Four" comics was published a year earlier than "Spider-man" but the live-action version of the former emerged three years later than the latter. As with any Marvel adaptations, the production of "Fantastic Four" was plagued with troubles and rumours way before. Issues ranging from the casting, director and effects were greatly speculated and the huge fanbase reacted with downright negative comments. Director Tim Story was apparently not the first choice. Chris Columbus of the Harry Potter series and Raja Gosnell of "Scooby-Doo" were attached at some points. Tim Story who has done only directing duties for "Barbershop" and last year "Taxi" remake were thus given a huge task to fulfill. Fortunately, he didn't really mess up the whole movie. Instead of the Hollywood norm of mutilating nearly every form of adaptations, Story and his screenwriter stayed close to the original source and edited the whole movie at break-neck pace. It’s as if Story is trying his very best to prohibit any room or breathing space for mistakes. The main plot of course (for those comics fans out there please endure this little paragraph) is pretty straight-forward. A group of five consisting of scientists, pilots and a billionaire industrialist are exposed to cosmic radiation which genetically altered their DNA. The group unexpectedly discovered that each of them have been blessed with superpowers way beyond their comprehension. As mentioned earlier, little changes have been made to the characters or plot. Except certain facts such as Mr Fantastic was the one who gave the foursome the nicknames rather than the human torch and The Thing’s blind girlfriend Alicia Masters was white in the comics. Well, these minor alterations can be still deemed as forgivable. Dr Reed Richards aka Mr Fantastic played by Ioan Gruffudd (“King Arthur”) is still a talent in the science field. Gruffudd who was pretty much ignored for his role did a great job in portraying the humble and “indecisive in love matters” leader of the foursome. The stunning Jessica Alba who is the Invisible girl aka Sue Storm will definitely have the male audience in awe of her excellent figure. (There’s one humourous scene of her in near “naked-form” to prove the fact). Johnny Storm, the highly impulsive brother of Sue is portrayed by Chris Evans (“Cellular”). Evans certainly stole most of the scenes, stealing the attention of the female audience and had audience in stitches with his constant tricks, squabbles with “The Thing”. Surprisingly, the suit effect was very much superior than the “Hulk” for Ben Grimm. At least the facial expressions were more effectively and genuinely carried out by Michael Chiklis who is a respected stage actor. He did a tremendous job in portraying the tragic, disfigured member despite the heavy, claustrophobic suit he has to wear. Dr Doom (Julian McMahon) one of the most popular villain of the Marvel universe is given the sort of familiar “Norman Osborn” treatment. McMahon’s Doom is a brilliant and vain scientist who gave way to the path of evil. His portrayal is recommended for its distance, cold and menacing scowl. Despite the fact that technological advancements in special effects have improved leaps and bounds over the years, Mr Fantastic’s elasticity effects still look a tad cheesy upon close-ups. But fortunately, the human torch’s fire effects are remarkably impressive. The swirling and bursting into the air in flames sequences will no doubt keep you to the seats. If you marveled at “Spider-man” action pieces, Story is going to pile you with the same amounts of action to keep your adrenalin going. The great highway rescue will show off the foursome’s potential powers right in the middle of the movie to whet your appetite. With four heroes and a villain who possessed impregnable armor and an arsenal of high-tech weaponry, the showdown is apparently going to keep you glued to the seats. 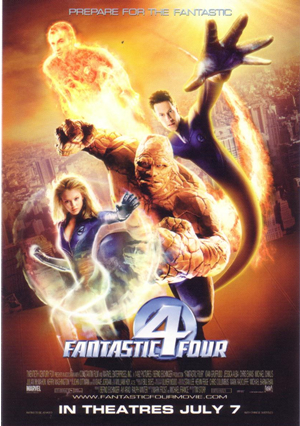 All in all, “Fantastic Four” might not fare as good as other Marvel’s live-actions such as “Spider-man” and the “X-men” series in terms of plotting and effects. But to be fair, Tim Story’s version of the super family of four is a great piece of entertaining product. Way better than the sleep-inducing “Elektra” or the profound “Hulk”. Will we see Franklin Benjamin Richards showing off his young mutant powers next? I can’t wait. By the way, creator Stan Lee once again did a cameo. As a mailman this time. Read what our members say about this movie here.